Richard was born in 1890, the son of Sidney and Kate (née Weller) Smith; they had four children: Edith Rachel (born 1884), William Sidney (1887), Richard (1890) and Benjamin Weller (1892). The family home was at 4 Church View Villas, this became 17 Blenheim Road when street numbering was introduced in the 1920s. 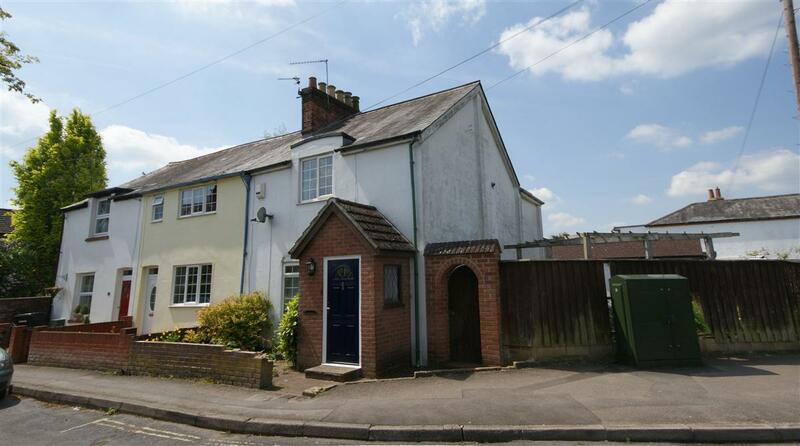 It was at the northern end of a terrace of four small cottages and was demolished to allow for the road around the corner it occupied to be widened and a pavement put in. The remainder of the terrace (11, 13 & 15 Blenheim Road) is still standing. The census return for the household in 1911 shows that all four children were still living at home and that the boys had all found employment in the building trade, William and Richard following their father’s trade as carpenter/joiners, Benjamin as a plumber’s apprentice. Richard served an apprenticeship with Elliott’s joinery works in Albert Road and was still working there when war arrived in 1914. His schooling was supported by the Cowslade Charity, a Newbury charity that provided education for ten young poor children, originally in the Corporation Bluecoat school. In 1912 Richard married Bertha Wheeler, very soon after which their daughter, Gladys, arrived. He enlisted in early 1915, joining the Royal Engineers, who had plenty of use for skilled craftsmen – though battlefield carpentry was probably not quite to the same standard as a furniture makers like Elliott’s. After training he was posted to the 106th Field Company, Royal Engineers who were Divisional troops with the 25th Division in 4th Army. Over the winter of 1916/17 the weather limited the ambitions of both sides, Allied efforts were concentrated on preparation for a major offensive in the spring. One method of preparation was the ‘trench raid’ – these extremely hazardous operations involved a party of men crossing no-man’s land and entering the enemy trench system. In doing so they would inflict as much damage as practical on the enemy, but the primary purpose was reconnaissance – to find out which troops were manning the trench, to search bunkers for any paperwork (orders, maps, signals, etc) and to determine the strengths and weaknesses of the defences – if possible some prisoners would be brought back for interrogation. Although the main Allied offensives were planned to take place in the French sector along the Chemin-des-Dames coupled with a British attack at Arras, trench raids were undertaken in all sectors (any chance of surprise would be lost if they only raided in areas where attacks were imminent). The account of the 25th Division on the Long Long Trail website states: The first quarter of 1917 was spent in the Ploegsteert sector: a relatively quiet time punctuated by frequent raids and minor operations. On 17 February men from two battalions of 7th Brigade, the 1st Wiltshire and 10th Cheshire Regiments were tasked with carrying out a trench raid. Part of the plan was to destroy enemy dugouts, to which end a detachment of 14 Engineers from the 106th Company (including Richard) were detailed to place the explosive charges needed to inflict any significant damage on the well constructed concrete bunkers. The raid took place successfully and the men withdrew back across no-man’s land, of course the enemy had responded to the raid and were firing at the men as they withdrew – all, no doubt, complicated by artillery fire from both sides. It appears that it was at this point that Richard was killed, his family being notified, probably in a letter from a member of his Company, that he had been shot in the head. This conjures up a very unpleasant picture, but one that carries a reassurance that he had not suffered. However, such letters invariably played down any suffering; everyone seems to have died instantly or quickly with no pain. 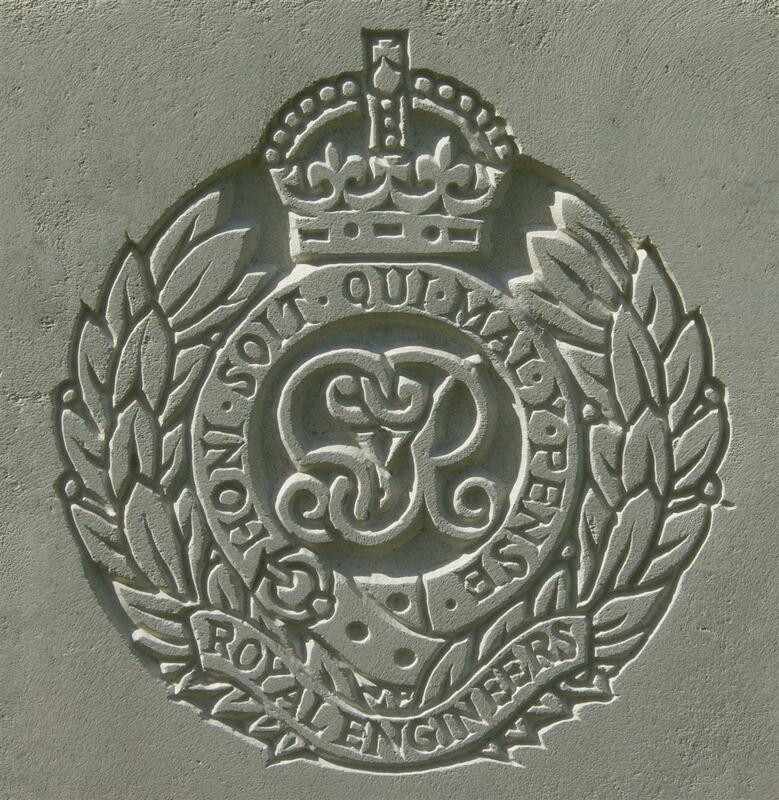 War Diary – 106 Company, Royal Engineers, 17 February 1917. Rest and bath day for Coy. Raid took place at 10.30am. The 14 sappers accompanied the 1st Wilts & 10th Cheshires. Several dugouts blown up. Casualties: 1 killed, 5 missing, 1 wounded. Seven casualties is not a large number for a unit involved in a trench raid, but, as only fourteen Engineers were involved, this was actually a very high casualty rate of 50%. Richard was probably the ‘1 killed’, though he may have been one of the ‘5 missing’. Either way his body was recovered from the battlefield and he was buried in grave I. O. 4 in the Berks Cemetery Extension at Ploegsteert. This cemetery was started the previous year when the 1/4th Battalion of the Berkshire Regiment were spending their first spell in the line. SMITH – In France, Sapper Richard Smith 32,935, Royal Engineers, second son of Sydney and Kate Smith, of 4, Church View, West Fields, Newbury, aged 27. It is officially reported that Sapper Richard Smith, of the Royal Engineers, was killed by a shot through the head whilst returning from a raid. He was the second son of Mr and Mrs Sydney Smith, of 4, Church-view, West Fields. He was 27 years of age, and a Cowslade boy, and a member of the Parish Church choir. Apprenticed at Elliott’s Joinery Works, he joined up two years ago, and had been in France eighteen months, having been home on leave a month previous to his death. He had been wounded twice before. A wife and child are left to mourn their loss. 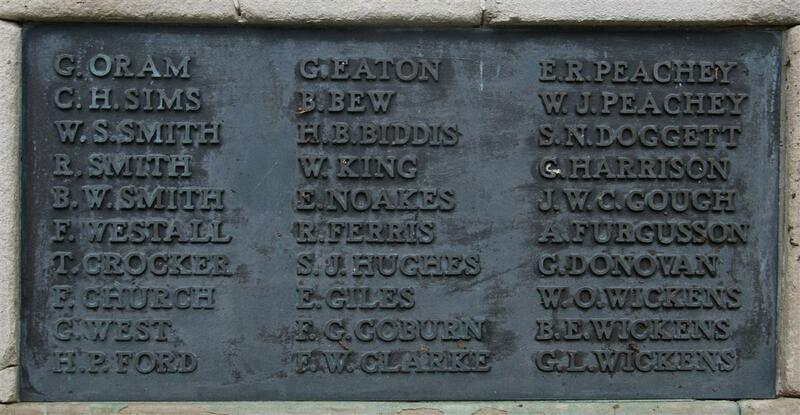 Richard's name on Newbury War Memorial, between those of his brothers. In loving memory of my dear husband, Richard Smith, who was killed in action on February 17th, 1917. From his loving Wife and little Gladys. Richard was the first of Sidney and Kate’s sons to die in this terrible war; next was Benjamin a few months later while serving in France with the Labour Corps; finally William fell, a victim of the German Spring Offensive in March 1918. Sidney and Kate had lost all three of their sons, none of whom was serving in the infantry or other very high risk role. Luck was most certainly not with them – as was most painfully made clear by the manner of Benjamin’s death – struck by lightning!